so A+ only can be connected between the tested device negative pole and power supply negative pole. The meter will be burnt if connected wrong.) Note: If the meter is just used as voltmeter, it is suggested that the yellow wire and black wire are connected together. WIDE VOLT & AMP MEASURING RANGE: DROK current voltage tester has the widest voltage measuring range (DC 4.5-100V) and ampere measuring range (0-20A), which is suitable for various measuring application. SIMPLE WIRING: The wiring of the digital ampere voltage detector is simple and effortless. This meter is provided with 3 wiring terminal, when testing voltage and current, the power comes from the return circuit, so you don't need extra power supply. HIGH ACCURACY: The accuracy of measurement is 1% (±1 digit). What's more, this electrical multimeter owns voltage calibration potentiometer and current calibration potentiometer, if there is an error, you can adjust them by yourself. STRONG ANTI-INTERFERENCE ABILITY: The tester multimeter has strong strong anti-interference capability, it can quickly display refresh rate; with exquisite SMT technology, it has good consistency. 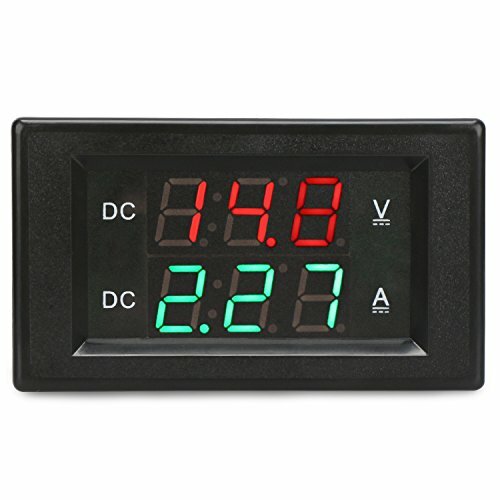 WIDE APPLICATION: The DROK voltmeter ammeter can be applied to monitoring storage battery, DC adjustable power supply, or voltage and current changing state of other device.